What Does the Collaboration “Field” Look Like? This hasn’t simply been a branding exercise. It’s been about looking systemically at what we need to do to improve how we collaborate, understanding what people in my “field” already know about this, and figuring out how to do it a lot better. What I discovered very early on was that there was an awful lot of great knowledge about how to collaborate effectively. The problem was that this knowledge was largely locked in silos. Ironically, the people who best understood collaboration were not collaborating with each other. One side-effect of this balkanization of practice is that many of these communities have gotten rigid in their practices. Fundamentally, organizational development professionals, for example, care about the same things as design thinkers, who care about the same things as “social business” consultants, which has largely evolved from social practices that emerged on the Internet. They are all trying to get people to work together more effectively. Moreover, they all start from the same philosophical place. Said simply: People matter. Start there. Despite these commonalities, there has been almost no cross-fertilization between these fields. That’s a huge problem. If we’re to create a world that is more alive, that is capable of addressing its most urgent challenges while celebrating our essential livelihood, we must learn how to work and be together more effectively. It is a need-to-have, not a nice-to-have. If the people who have devoted their lives to this problem are not themselves practicing this, what hope do we have? When I first got into this space, I was blessed with ignorance. That allowed me to learn from different fields without any particular bias for how things were “supposed” to be done. My Groupaya partner-in-crime, Kristin Cobble, took a more “traditional” path than me, but she arrived at the same place. We both believe that group work is a systemic practice, that we need to approach it with an open mind and heart, and that the wisdom for how to do it well is fragmented across multiple fields. If we can learn how to integrate these practices, we’ll have taken a huge step toward a world that is more alive. That’s what we’re trying to do at Groupaya. We’re trying to integrate the best of all these related fields — organizational development, design thinking, free culture movements on the Internet, Web (and Enterprise and Gov) 2.0, community organizing, and so forth. Recently, I decided to try and test some of my beliefs about the state of the “field.” I thought about where I could find data about different professions and how they might be interlinked, and I decided to poke around on LinkedIn. In addition to being an amazing service, LinkedIn is sitting on top of an enormous repository of human-generated, real-time data, which they have started to expose in lots of interesting ways. 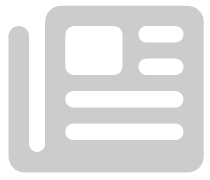 One of those ways is a skills database, where you can search for specific job skills and find people in your network who have listed those skills on their profiles. What’s even more interesting is that it derives a list of related skills based on the other skills those same people list on their profiles. It amounts to the world’s most accurate taxonomy of skills, because it is based on what people are actually doing and how they describe themselves. I decided to come up with a core list of skills that we practice — organizational development, leadership development, facilitation, design thinking, leading change, knowledge management, group learning, etc. 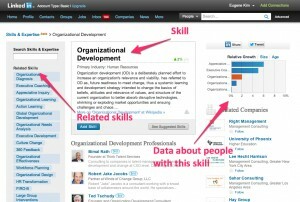 — and to capture all of the related skills that LinkedIn listed. My core list of 45 skills had 878 related skills. Sometimes, these skills pointed to each other. More often, they led in entirely new directions. Each circle represents a skill. The colors of the circles represent “degree” or connectedness, ranging from blue (least number of connections) to red (most number of connections). You’ll notice a bunch of small clusters of blue-colored balls, often clustered around a ball that is yellow or orange. That reflects the methodology I used. Each core skill on my list had about 20 related skills, which meant it automatically had at least 20 connections, and hence would lean toward the red side of the color spectrum. Most of those related skills had zero additional connections, hence the blue. There are several patterns here worth noting. First, the network is complete. In other words, there is a path from one skill to any other skill in the map… barely. The stakeholder engagement cluster barely made it. 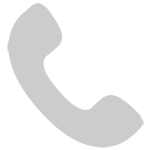 The densest cluster is the organizational development cluster, which is left of center. There are a bunch of skills here that are tightly interconnected, largely centered around leadership development, coaching, and group transformation. 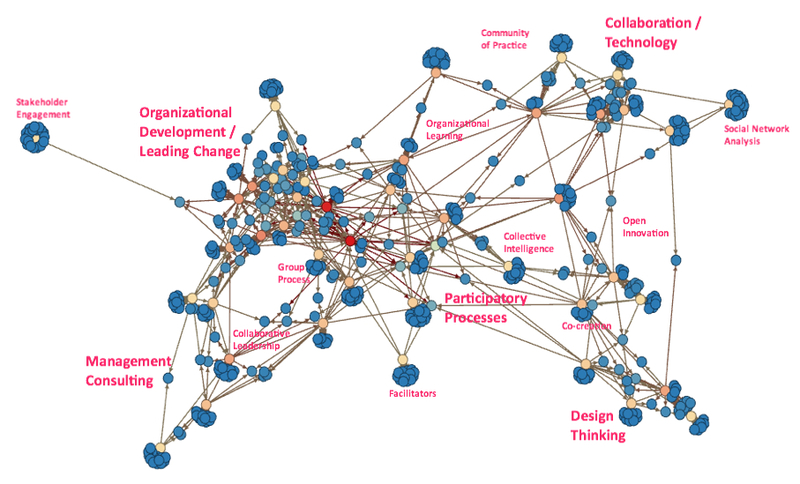 The other large, dense clusters — management consulting, participatory processes, design thinking, and collaboration / technology — are largely distinct, although there is some bridging, mostly around learning-related skills. This makes sense: A high-performance group is a group that learns, a conclusion that you should draw regardless of your starting point. I was disappointed, but not surprised, that “collaboration” as a skill was mostly lumped with technology skills. Folks in the Enterprise 2.0 space, for example, have almost no overlap with organizational development professionals. It’s a troubling trend. Although people are fond of saying, “It’s not about technology, it’s about people,” there’s not much practice validating that mantra. On the flip side, it’s disappointing that organizational development professionals have stayed removed from some of the amazing trends in the technology sector. Kristin suggested that the field has traditionally been suspicious of technology, because of a belief that it is fundamentally dehumanizing. There may be some truth to this belief (the philosopher, Heidegger, claimed as much), but using this as an excuse to avoid this area entirely is tremendously misguided. Any guesses as to what the two bright red circles — the two skills that had the most connections with other skills in the map — are? You get a (virtual) cookie if you guessed Action Learning and Appreciative Inquiry. In a perfect world — the world we want to create — I’d like to see a map that is more evenly distributed, with many more cross-connections. This map validated our belief that there is a lot of bridging that needs to happen if we are to learn how to work together more skillfully. 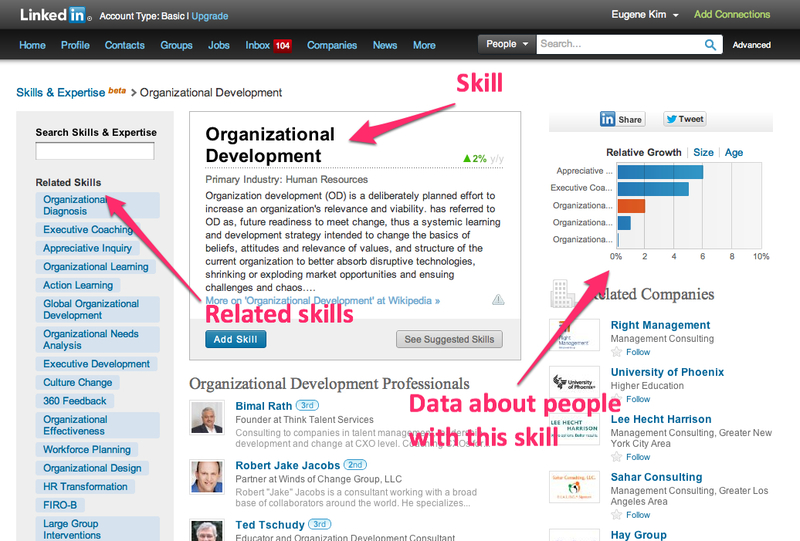 It also showed how rich of a research resource LinkedIn can be. Maybe one day, this process will also help me describe the work that I do without resulting in blank stares. Great post, Eugene! I’ve noticed the same thing re: Organizational Development folks and technology folks. I’m relatively new to the OD world, but old skool in tech, and every time I interact with people in OD I think, wow, I could learn a lot from these folks, and I think they could benefit a bit from our open source-inspired way of thinking. But other than some really interesting conversations and a few blog posts and articles here and there, it’s been hard to get anything meaningful going. Maybe we are all just busy living in our own universes or maybe it is something akin to what Kristin said? I’m not sure. But I’ll try to point some of my OD friends to this post and see if they have any ideas. Thanks for sharing your thinking, Paul. Looking forward to seeing the results of your data mining. Interesting observations and I’m not surprised by lack of connections on your map. I’m one of the OD minority who has successfully used technology as an enabler as well as gotten the budget approved for technology resources when I was a talent management executive for a company. As mentioned, there’s a fear of technology among OD professionals and I’d add HR people who are important (they influence/manage the $$ for leadership development and sometimes OD and change management). A lot of companies in the last few yrs have focused on the “basics” and HR leaders have become risk-averse. I was asked recently to create an internal learning community for execs only of a large digital media company. Stakeholder interviews revealed that they needed a lot of basics and it required the IT organization to invest in an social networking platform company-wide that was surprisingly non-existent. Everything was balkanized in terms collaboration and technology. No surprise, it’s a company that is heavily siloed and not rewarded for cross-functional collaboration. It would take the CEO & staff to make a budget decision in the face of a ka-zillion competing priorities and it wasn’t going to happen anytime soon. One of the more simple conclusions I’ve come to is that it’s difficult to build trust if you lead with technology. But it doesn’t require only F2F only. It’s finding the right mix of F2F (at intervals), synchronous and asynchronous engagement. It still requires classic OD skills to help a team or team(s) build trust in order to best collaborate. 2. Community psychs theories on ‘person fit environment’ and vice versa could be useful knowledge in business. Pingback: Blindfolded Employees: Cooperation or Collaboration? OD is dead. Long live OD. It died because it’s practitioners were hammers looking for nails. “How do you improve the organization? Collaboration/Group functioning. “Why arent we as effective as we want and need to be? Not enough collaboration/effective groups.” Go look at the screen shot definition of OD: “…thus a systematic learning and development strategy intended to change the basis of beliefs, attitudes and relevance of values…” What CEO thinks that is the biggest problem she has or something she could quickly affect with an L&D strategy? Everyone should stop saying they are OD professionals and start saying they are Organizational Effectiveness/Excellence (OE) experts. But right before they do that, they should write out their theory of/diagnostic for organizational effectiveness/excellence which answers these questions: is the organization delivering value to all three stakeholders? If it is not, what are the drivers/precursors of OE that you going to look for to see if they are present or not present? If your dishwasher stops draining, the appliance repair guy comes out with a series of things to check. If you decide the organization is not delivering the value it could be delivering, what are the things you are going to check? If what the OE consultant is checking does not include such things as process understanding and execution, metrics, line of sight priorities, VOC, VOE, talent development, operating mechanisms, living strategy development, assessing the alignment of the culture to execution of the strategy, etc, then in my opinion, that OE consultant has no idea what he/she is doing and should be shown the door. Collaboration and better group functioning may be one of the things that needs to be fixed over time, but I guarantee it will not be among the most critical items on the list of limitations to Organizational Effectiveness. My belief is that anyone who defines themselves narrowly as an expert in collaboration and delivering group process on steroids will soon be looking to supplement their consulting practice with other income streams. ← Lessons from Olympic Gymnastics: What Makes a “Team” a Team?